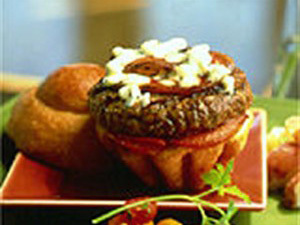 A grilled beef burger served on a split brioche roll, topped with sweet oven-dried tomatoes, pancetta and melted Gorgonzola cheese. Cibo is Italian for "food", and this mouthwatering masterpiece is Italian for "Bacon Cheeseburger". The bacon is pancetta, the cheese, gorgonzola, the tomato is slow-roasted and the bun's a brioche. Proof-positive that a burger translates deliciously to any language. Halve tomatoes lengthwise; squeeze to remove seeds. In bowl, toss tomatoes with oil, pepper and salt. Place tomatoes cut-side down on sheet pan; roast in oven 3 – 6 hours (depending on moisture content of tomatoes) until shriveled but not dry. Cool; cover and set aside. Place pancetta on rack on sheet pan; bake at 400 F in oven for 10 to 12 min until crisp. Grill 1 beef patty to 155 F for 15-second hold. Place 3 roasted tomatoes on roll bottom. Top with burger and pancetta slice. Sprinkle 1 oz. cheese over pancetta. Melt in salamander; remove and cover with roll top.